I am sitting on my patio back in South Africa, and I keep on having to pinch myself as last week’s SourceCon Seattle seems like it was a dream. I have that ‘too good to be true’ feeling as I loved every minute of my second SourceCon Conference experience. 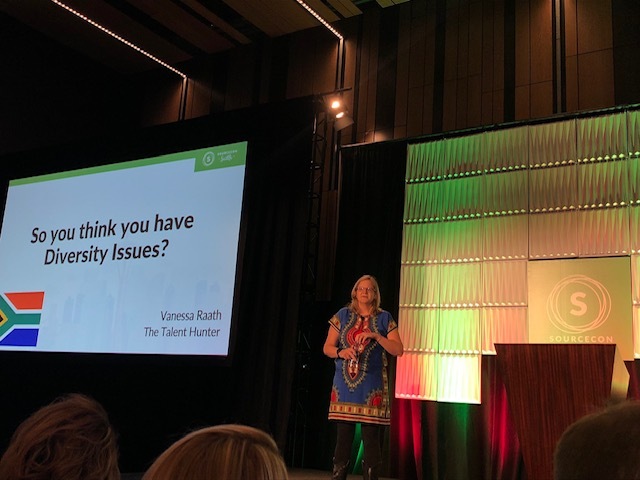 The real highlight of the conference for me was being given the incredible opportunity of standing on the main stage and delivering a keynote about a topic that I am ridiculously passionate about – diversity recruitment. 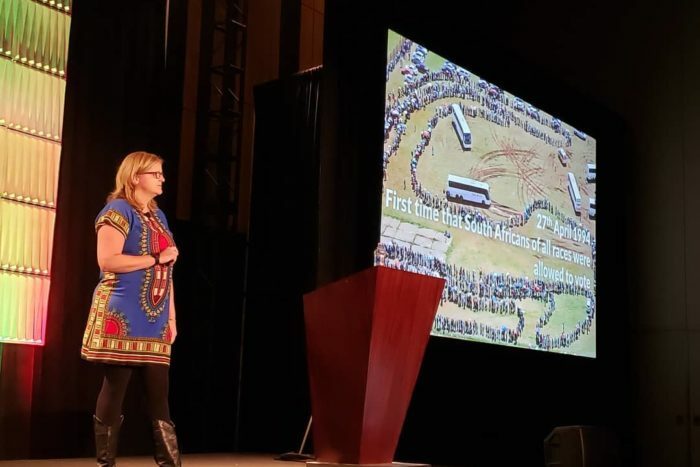 I can still remember the exact moment when Shannon Pritchett asked me to come over to Seattle to keynote at the recent SourceCon event. I was shell shocked. Shannon had only known me for two days and had never seen me present before. If Katrina Collier had not nudged me to say yes, I might still be standing in the Marriott Budapest doing my best Goldfish impersonation. Being asked to keynote is such an honor and I was determined to compile and deliver the most outstanding presentation of my life. I did not want to disappoint Shannon, so I started working on my keynote as soon as I stepped off the plane from Budapest. I am so glad that I started working on this presentation so early. I began by talking to anyone and everyone who would listen to me here in South Africa. I spoke about tough topics like apartheid and how it affected people’s lives and where they are today. These conversations were fascinating, and I learned so much more than I ever expected too which made all of my research such a valuable experience. After many hours of research and fighting with PowerPoint, I managed to complete my presentation, and the rehearsals began. I do not like to be too rehearsed when I present so every time; I went over my session it was different! All I could hope for was to deliver the best story that I could when it counted. The day finally arrived, and my beautiful family dropped me off at the airport in Johannesburg, and I was on my way – ready or not! I was about to embark on the longest journey of my life as I think Seattle is pretty much as far from South Africa as you can get – have a look next time you see an old school world globe! The flights were long, but I made some great new friends, and I was pumped for my new adventure and an opportunity to explore a new city. My presentation was on the third day as we thought that I would need the extra days to get over the jet lag. (In hindsight, the jet lag was way worse coming back!) I sat mesmerized by the speakers on days one and two, and I was full of self-doubt as to whether I would be able to maintain the incredibly high standard that had been set! Also, just my luck, I was set to present after Susanna Frazier, sourcing machine and a real-life version of the energizer bunny! Angie Verros introduced me to the crowd then I was up! Months of preparation were about to cumulate in the next 45 minutes of my life. Thankfully, I managed to get the butterflies in my stomach to fly in formation, and I can honestly say that I left ‘my everything’ on that stage. From my opening introduction, which I challenged myself to do in Zulu, to my conclusion – I can honestly say I poured my heart and soul into that presentation. During the presentation, I could not ‘read’ the crowd. Back in South Africa, I am always a funny presenter. I am known for being full of energy and super funny, so I tend to get a crowd going with relative ease. I am not too sure if I was just in ‘the zone’ or whether I was not paying close enough attention to the crowd’s reactions, but I had that sinking feeling that my presentation was falling flat. Bearing in mind that with those bright lights you can only see the first couple of rows. As I was nearing the end of my presentation, I started to notice, or should I say hear, sobs from the front row. All I could see were Ann Wilkerson and Tangie Pettis who were passing tissues between them and crying. I realized that I had hit a chord with the pair of them, but I never realized that I had done the same to the vast majority of the audience. When I finished my presentation, I said my thanks and started to walk off the stage. As I had battled to read the audience throughout my keynote, I thought I had bombed my talk, and I was convinced that no one would have any questions for me! Thankfully Shannon stood up and herded me back on to the stage where I was delighted and humbled to be in the middle of receiving a standing ovation. What I realized and the real point of this blog, is that Americans do not talk enough about racial issues. As a South African, we are continually dealing with racial problems and tensions, so we constantly have to talk to understand each other better. It seems like Americans, unfortunately, skipped this step in their transformation process. So many people, of all races, had a story to share with me about an incident, good or bad, that had experienced during their careers. I would love to be able to collect these stories and share them with the audience again as you need to listen and hear each other’s stories. Brushing these stories under the carpet is not going to do anyone any favors. I never realized how close to the surface these racial tensions in the US were bubbling. I fear that if these emotions are not spoken about or even workshopped, they will boil over and cause untold damage. I encourage and implore everyone to start talking to people of all races and try to gain an understanding of how they live their lives, their upbringing and what makes them tick! This has to start happening now before it is too late. On that note, I would like to leave you with the one key takeaway that I wanted to leave the audience with: Judging a person does not define who they are. It represents who you are.